Our Amazing Staff Stand Ready To Provide Exceptional Eye Care with a Smile! Our eyewear dispensing goes beyond customizing prescription glasses in St. Louis. Our optometrists have visited developing countries around the world to provide eyeglasses to those in need. We also provide free eye exams for infants through the American Optometric Association InfantSEE® program. Find out more about our unique Optometric Practice. We stock our optical with a wide range of contact lenses and eyeglasses including designer eyewear frames, offer online contact lens purchasing and continue our tradition of dedication to advanced technology. I always get such a thorough exam from Dr. Terry at Rosen Optometry. The staff takes their time to make sure my needs are completely met and explained. I can't imagine going to another place for my vision needs. The staff at this office are an awesome group of ladies that go out of their way to make this experience fun! I will miss Doctors Rosen but I do love Dr Tary so I will continue to go here for as long as I can! Amazing customer service & Quality Care! Have been with Rosen for years, and never had a bad experience. Staff is very helpful and friendly. They go above and beyond to help with any issue. Trust me this is coming from a guy who’s very hard on his glasses! Regardless of the volume of patients they have at any time. They’ll take the time to help you and ensure you are satisfied before you leave. I appreciate everything you guys do! Will go no where else. You all are amazing!! I am most happy with my experience with Doctor Ashley Tary. The staff also made feel comfortable and were very helpful with any questions. Thank you to all. Excellent service. Very helpful. Highly recommend. New patient. 12/22/18 was my first appointment at the office. Upon my arrival I was greeted right away. The lady who did my exam was very friendly and professional. All the way from Dr Rosen to the young lady who had to stay late because of me were very friendly and professional! Dr Rosen explained very thing to me and even showed me things about my eyes I’ve never seen before! As well as the young lady who helped me pick out my frames who nailed it! She broke down all the cost and even had options if I didn’t want to spend that much or if it wasn’t in my budget. They even told me the best way to get the most out of my insurance plan! I have allergies. Can I still wear contacts? People with allergies. Daily disposables may actually help with eye allergies! Since there is less time for dirt or irritants to build up in the eye, daily contacts allow allergies a lower chance to flare up. Additionally, a fresh, smooth, clean, new lens surface every day is the gentlest option for irritated eyes. 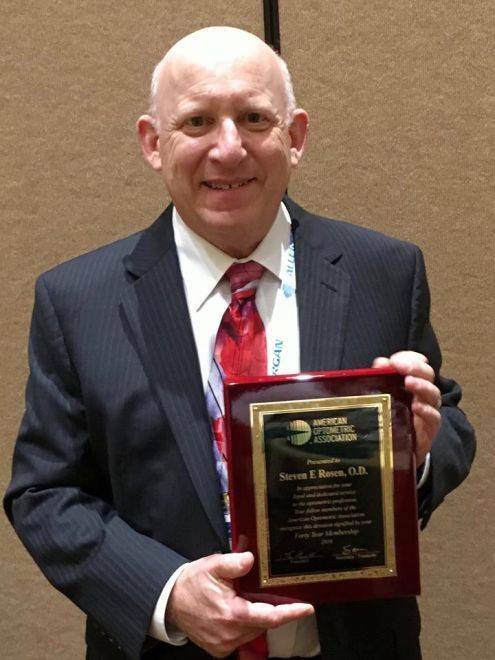 award from the American Optometric Association for an exemplary 40 years of service to the profession of Optometry. Check Out our Unique Selection of Beautiful Frames and Sunglasses, to help keep your eyes healthy and you looking great! Because we provide both medical and routine eye care, we accept a number of insurance plans to help cover the cost depending on your individual needs. Here are just some of the plans that we accept and go to our Insurace page for more information! Were you told you couldn't wear contacts? Almost everyone can comfortably wear contacts today. At Rosen Optometry we have a myriad of lenses including dailies, multi-focal and lenses for astigmatism. Come on by today and we will help you navigate the world of contact lenses! 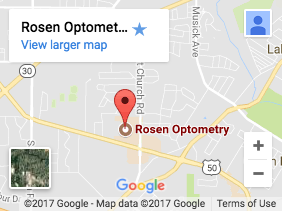 Rosen Optometry is associated with VisionSource and is located in South St. Louis County, Missouri, and has been serving Crestwood, Affton, Concord Village, South St. Louis, South St. Louis County, and surrounding areas for more than 25 years. We work with many insurance plans including VSP and CareCredit. You can ask our friendly staff for more information about insurance. Call during our office hours to speak to someone at the office and book an eye exam. Or request an appointment online, fill out registration forms and get Google Maps directions any time. If you have a moment, please give us your feedback about our site and your experiences with our Practice. Our St. Louis eye care Clinic has been serving Crestwood, Affton, Concord Village, South St. Louis, and the surrounding area for over 25 years. We welcome new patients of all ages to join the ranks of our many happy clients. Rosen Optometry - Located at 17 Ronnie's Plaza, St. Louis, MO, 63126. Phone: 314-843-2020. https://www.rosenoptometry.com.